I was all set to take a couple of my kiddos to the summer disaster flick SAN ANDREAS because it seemed to be a movie of commercial and mass appeal across multiple ages. But we soon realized my true mistake was in accidentally picking the 3D version (which simply won’t do for my vertigo affected eighteen year-old) so with time constraints, we opted for Cameron Crowe’s latest, ALOHA (2015). While ALOHA wasn’t my first pick, it seemed to be ripe with a splendid cast so worth a viewing. When asked by my fourteen year-old as we walked in as what this film was about, I told him I couldn’t say, based on the trailer. As we walked out, I asked him what he thought of it. He said he wasn’t sure. As for me, I knew what he meant. ALOHA in its deep Hawaiian themes, is what I call a meandering film. The course of the story takes us on an uncertain stroll of several plots. We come in without a clear structure. Director/screenplay writer/producer Cameron Crowe likes to play it loose and off-beat as we’ve seen from his many films like SAY ANYTHING (1989), JERRY MAGUIRE (1996), and Oscar-winning ALMOST FAMOUS (2000). The several stories layer like petals of a pineapple flower. The real focus as we attempt to sort out the various plots is left on the characters. -Bradley Cooper as Brian Gilcrest plays the sometimes military/sometimes private contractor whose reputation precedes him, in both good and bad history. His past reflects a man whose singular obsession and superior talents lie in the heavens of astrophysics since boyhood. With severe injuries from serving in war, sketchy relationships in private contracts and a changed landscape of space pursuits since the 2008 defunding of NASA replaced by civilian billionaires, he arrives to a tarmac of somewhat questionable welcomes. 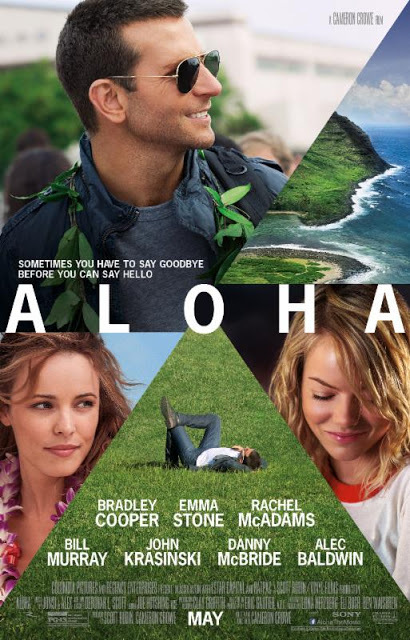 -He’s come home to his past in Hawaii, the US Space Program in Honolulu- a past of the girl that got away (Rachel McAdams as Tracy Woodside) who now has a family of her own on the military base but these two still have unresolved matters. Her charming family includes the silent husband John Krasinski as John ‘Woody’ Woodside who says a mouthful with no words (and steals scenes in the process), a thirteen year old daughter (Danielle Rose Russell as Grace) with a savvy for the hula like a true native and a younger son (Jaeden Lieberher that cute kid from ST. VINCENT as Mitchell) with a google-like knack for Hawaiian folklore. -He’s been assigned a watchdog, the quirky Air Force fighter pilot Allison Ng (the magnetic Emma Stone), who is essentially his babysitter as he proceeds in negotiations with sovereign King of Hawaii for airspace rights as they plan to launch a satellite with questionable intentions. She’s a fascinating character in the film although she’s so interesting her character seems almost unbelievable. For instance, who utilizes a highly trained female fighter pilot as a glorified babysitter? She’s a mix of super nerdy, ultra-strict military protocols, strong moral compass and Hawaiian superstitions (due to her being one-quarter Hawaiian as she insists with her big pools of blue eyes, fair skin and strawberry blond hair) and sometimes she even relaxes her jet-fueled energy by cutting a rug with billionaire Carson Welch (Bill Murray) who is financing this entire project. There are a few other characters of interest including ill-fitted yet humorous Alec Baldwin as General Dixon and Danny McBride as Colonel ‘Fingers’ Lacy. Bill Murray was a joy in this fairly small role because, let’s face it; he could do nothing but attempt to hand-knit a Hawaiian shirt for thirty minutes straight on the big screen and I’d find it utterly delightful. Ultimately, the muddled mix of plot paths forces us to examine the characters more closely which does provide entertainment. That is if you accept and submit to this trip without any desire for a clear compelling structure or end in sight, you may find the stroll worth the journey. I bid Aloha to ALOHA- because I left right where I began. Thanks for writing a review on this film. Haven’t seen many at all. It sounds interesting. Good review!! Thanks! Good actors and some entertaining moments but oddly strung together. I’m understanding there’s some controversy out there with the casting of Emma Stone as even one-quarter Hawaiian, but I have no issue with that as I was compelled by her portrayal, a by-the-book military gal, who softens up. I loved the music during the scene at the dance ( yaaaay! my era! ). I liked how unresolved issues bubbled up and were resolved. 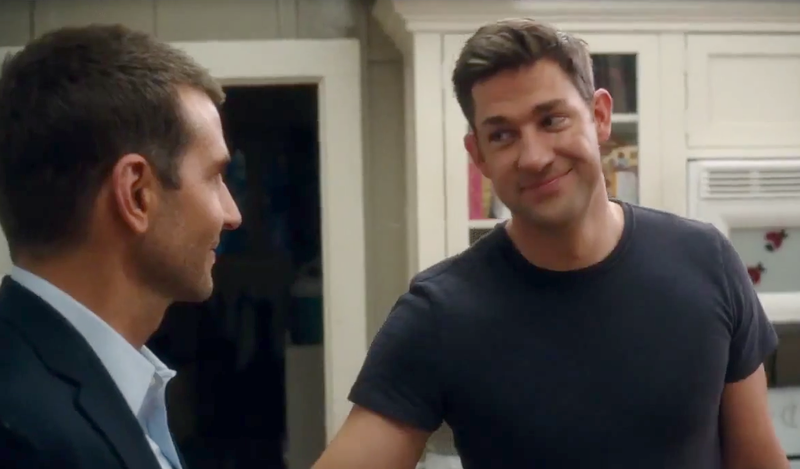 I also thought really cute was the silent non-verbal man-talk between Cooper and Krasinski. Haaaa! Thumbs up. This was a quieter film, loved how Hawaiian folk lore was explored ( was over the moon about the King’s t-shirt ) and that Crowe tackled that issue of the ramifications of taking over another’s culture. I’m not sure if he put all the pieces together in a seamless way, but you hit the nail so correctly on the head Kellee when you write it’s a meandering film. Can you imagine, walking in Nature…and not one marauding Tyrannosaurus in sight. Enjoyed your review. Love all your details and insights here- we are definitely on the same page. Yup- no T-Rex to be found (not that there’s anything wrong with a terrifying, exhilarating blockbuster sometimes) but sometimes ya just wanna go for a stroll and get to know characters deeper- even if strung along in a loose plot- just to meander. And SOOOOOO true on the stewardesses!! 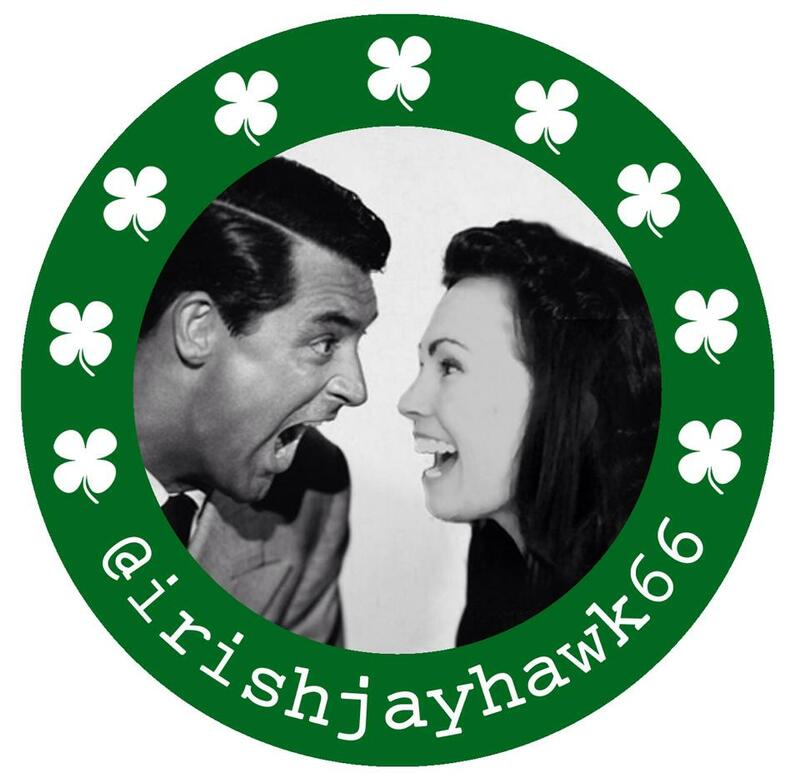 I agree with CineMaven’s assessment about the fact that Crowe’s films are more character-driven than plot driven. I seem to be seeing a lot of that in films lately. Modern film: Probably Jurassic World or Spy. Classic: all day noir tomorrow! I assume you’re taking the noir class, right Theresa? ?